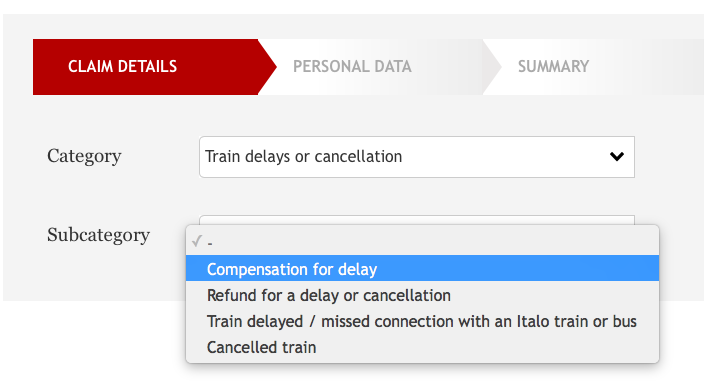 If your Italo train is delayed or disrupted, you can claim credit directly with Italo. The following guidelines will assist you. If your train is delayed more than 60 minutes, Italo will automatically issue credit via their website. Go to their "Manage Journey" page and enter your PNR, name and surname. If no credit is shown after you click "continue", then follow the steps to submit a claim below. Name, surname, email address and phone number. Ticket code (your paperless reference). If Italo has not automatically credited you for a delay of over 60 minutes, you can fill out the claim form on Italo's site. Select the appropriate reason, and follow the instructions. Click "continue". You'll then be asked to enter your personal data (name, email address, and phone number), Once you've done that, you'll see a summary of your clam and information, after which you can submit your claim. Italo do not accept illness or bereavement claims. You will need to pursue a claim for either of these circumstances through your travel insurer. Italo will automatically issue refunds in the form of Italo Credit, which is valid for 365 days on any Italo journey. To redeem your Casa Italo credit, you will need to sign up for a Casa Italo account. You can request a bank transfer in the amount of the credit. To request a transfer, please call +39 06 8937 1892 (from outside Italy) after your claim has been approved.